A lack of employee education—Even in great times many organizations failed to provide enough tools, training, and support to help employees uncover great talent within their network, so during tough times, it’s no wonder that education efforts all but go away. Without referral events, manager executed referral activities, smartphone parties, referral open houses, “Give me Five” visits, and priming exercises, ERP’s become purely reactive and fail to produce the volume of flow needed in the most critical areas. No referral cards—It’s such a simple thing to offer key employees “referral cards” to hand to individuals they meet that impress them. However, most programs either have no cards or they fail to replenish an individual’s supply on a regular basis. The best referral cards include praise for the individual and an action statement that encourages them to apply for a position. Equal rewards for all jobs—All HR programs should reward performance, and referrals are no different. Referrals for hard-to-fill jobs and mission-critical jobs should get a bigger bonus then the jobs that are easy to fill. In addition, there should be a supplemental bonus if someone turns out to be a top performer after they are hired. If you fail to include reward differentials, your key jobs will be filled more slowly or not at all. In fact, the best programs allow referrals only for jobs that are high impact or are hard to fill. No feedback on weak or bad referrals—Most employees have good intentions when they’re making referrals but if you don’t notify them after they’ve made a particularly weak or bad referral, they have no way of improving their future referrals. The best process is to notify the individual both when they’ve made a great referral, but also when they’ve made a weak one. The best systems rate referrals and the individuals making them so that future referrals by this individual are given a higher priority as a result of their previous successful track record. Individual recruiters are allowed to “ignore” referrals—It’s not unusual for regular recruiters to ignore or pay little attention to candidates that come from employee referrals. It’s generally an ego thing because they didn’t initially “find” the candidate. 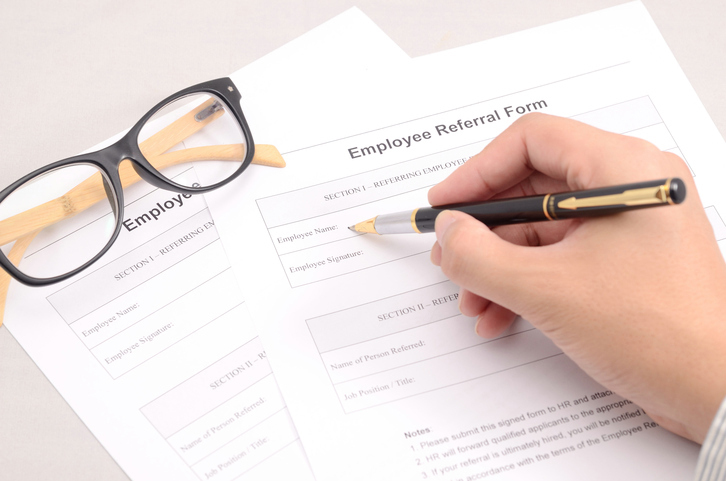 But in any case, there needs to be measures and rewards that encourage recruiters to focus on employer referrals. Not tracking referral rates—Employer referral rates vary dramatically among departments in almost every firm. If the program manager is to increase participation in these underperforming departments, there needs to be a process to track and report participation by the manager. In the best cases, participation rates are part of the manager’s bonus formula. Outdated prioritization—Well-designed referral programs prioritize vacancies based on their business impact and referrals based on the past referral success rate of the referrer. However, over time the organization’s priorities may have changed. Failing to do periodic upgrades—The performance of even the best-designed referral programs degrade quickly when program evolution ceases. Not utilizing metrics—Great referral programs rely heavily on metrics to continually improve, but when times get tough, metrics often all but disappear. Failing to scale—In tough times organizations merge and get acquired. If your organization has done either, it’s not uncommon for a program designed for a small organization to be ineffective in a larger organization. No globalization—If your organization has become a truly global one, as many have, it is essential that your ERP be globalized. So look at all processes, communications, and policies to ensure that cross-border referral of talent is being facilitated, and that all possible scenarios have been planned for. Identify what elements of your global program may require localization (communications, rewards, etc.) and develop a matrix specifying each. In order to maintain continued success, referral programs need continuous reengineering. I recommend that you put together an audit checklist and use it to periodically to assess the program and to identify any potential problem areas. Dr. John Sullivan is an internationally known HR thought-leader from the Silicon Valley who specializes in providing bold and high business impact and strategic Talent Management solutions. He’s a prolific author with over 900 articles and 10 books covering all areas of Talent Management. He has written over a dozen white papers, conducted over 50 webinars, dozens of workshops and he has been featured in over 35 videos. He is an engaging corporate speaker who has excited audiences at over 300 corporations in 30 countries on 6 continents. His ideas have appeared in every major business source including the Wall Street Journal, Fortune, BusinessWeek, Fast Company, CFO, Inc., NY Times, SmartMoney, USA Today, HBR, and the Financial Times. In addition, Dr. Sullivan writes for the WSJ Experts column. His articles can be found all over the Internet and on his popular website www.drjohnsullivan.com.